Instant Pot hard boiled eggs are easy to cook and peel like a dream! 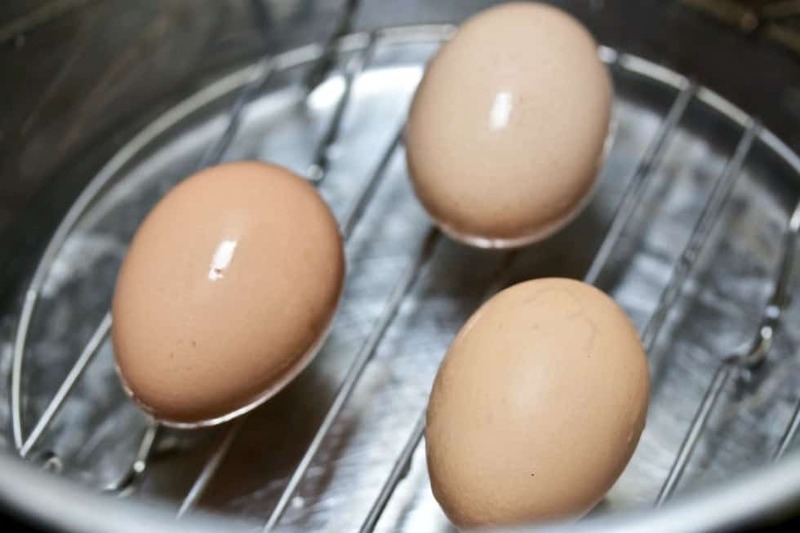 Have you hard boiled (actually you are steaming them) your eggs in the instant pot yet? If not, DO IT! This is the simplest and BEST method of hard boiling eggs. Our tips help you make YOUR perfect hard boiled eggs with almost no work. Instant Pot Hard Boiled Eggs are beautiful and SO easy to peel. Enter the wonder, simplicity and ease of the Instant pot. There is magic in my ole Instant pot. I swear it’s true! Watch Kayti make hard boiled eggs in her Ultra Instant pot and we included our Creamy Egg Salad Recipe too! As you will see, It’s incredibly easy to do. You can make a LOT of eggs at one time (up to a dozen) which I find very convenient. 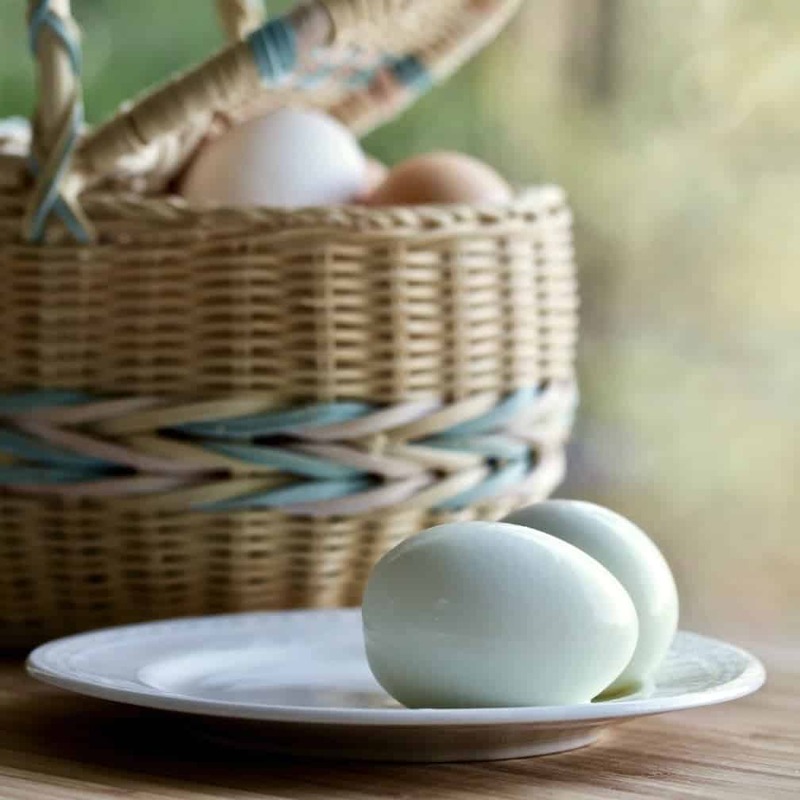 With a bit of experience you can make soft or hard boiled eggs as you prefer. Dave brings farm fresh eggs in every night. In Spring the hens make a LOT of eggs that accumulate quickly in my fridge. Today I had several dozen farm fresh eggs stockpiled that really needed to get out of my fridge. We love to eat eggy comfort foods on cold rainy weekends and this one is promising to be a doozy. So I made Homemade Angel food cake(I froze it for later) Homemade lemon Meringue pie, Homemade Vanilla pudding and a HUGE batch of my Smoky Potato Salad. Smoky Potato salad and My recent visit to see my Louisiana family inspired this post. My daughter Amanda and her husband are on the KETO diet. They eat hard boiled eggs for quick high protein snacks and use their [easyazon_link identifier=”B01B1VC13K” locale=”US” tag=”homefoodjunk-20″]8 quart instant pot[/easyazon_link] to make their hard boiled eggs for the week. After a year and a half of making Instant pot hard boiled eggs, it’s about time I shared our experiences and tips making hard boiled eggs under pressure. It’s not a state secret but if you are having trouble with over cooked or exploding eggs in your IP, read on. Instant Pot Hard Boiled Eggs. Love LOVE LOVE how easy they are to peel. The instant pot makes cooking eggs very easy and versatile for whatever purpose you have in mind. BTW You CAN cook eggs and potatoes together in the instant pot. I have done this many times and it makes potato salad really easy to prep. Just cook them in the IP then pop them in the fridge right in your IP insert. The eggs weather the extra cooking time the potatoes require ok but use a quick release. If you don’t want the eggs a bit slimy from the potatoes put them in a container (I use my Ekovana pot ) uncovered and set it on the potatoes. Then it’s really easy to put the container under cold water, peel the eggs, cover them with the lid and chill em in the fridge. The eggs, once shelled, are UNMARRED. Not that your potato salad cares but If you need pretty and easily peeled hard boiled eggs use this method. It works great for deviled eggs. AND if you don’t have time to peel the eggs when they come out of the instant pot. Go ahead and chill them in the fridge peels on. They will STILL peel easily once cold. Steaming the eggs under pressure releases the tough membrane under the shell from the cooked egg. This allows the peel and membrane to come off easily hot or cold. Deviled eggs are No longer a problem! My Deviled Eggs with Bacon, Peppers and Dates are suddenly much easier and quicker to make and look great on a party tray. Boiling Eggs in the instant pot is easy. Add water to the insert and load the eggs on the trivet. Lock the lid. I set my eggs right down on my instant pot trivet or in my ekovana pot. I have seen [easyazon_link identifier=”B075WFBCSW” locale=”US” tag=”homefoodjunk-20″]metal egg trivets[/easyazon_link]that look pretty fine but I have not yet purchased one. Let me know your favorite way to load eggs into your instant pot! There are THREE variables that affect your perfect hard boiled egg outcome. TIME SET-Many recipes call for different times to make the ‘perfect hard boiled egg’. Experiment to Find your perfect time (but keep it under five minutes on high pressure for best results). PRESSURE LEVEL-toggle to low (for soft yolks) or high (for hard yolks like you see in this post). QUICK OR NATURAL RELEASE– quick release for soft yolks(almost runny eggs on low pressure) and natural release for a harder yolk. How hard do you want the egg yolk? You can finesse this recipe to make it convenient for you with just the results you prefer. But it may take a few tries to figure out how to make YOUR perfect eggs in your pressure cooker. Eggs do explode sometimes when cooked at high pressure over five minutes. And the egg yolk can over cook too as evinced by the notorious green rim on the yolk. Still perfectly useful for salads and stuff but not the preferred result. It is REALLY easy to forget about a pot of cooked eggs and let them natural release too long. (You CAN overcook eggs in your IP by leaving them in the pot too long-even after the valve drops and the pressure is gone. It’s still hot in there!). Set a timer if you need to so you don’t forget to get them out of the pressure cooker before they are over cooked. Peeling instant Pot Hard boiled Eggs is easy. Just cool the hot eggs in a pot of cold water. When cool enough to handle peel the eggs under cool running water. The shells slip right off! I like to load up my pressure cooker with a dozen or so eggs at once. I use the ones I need for whatever recipe is in play and store the leftover hard boiled eggs up to a week in the fridge for a quick high protein snack. Or make an easy packable lunch with whole peeled IP hard boiled eggs or creamy egg salad sandwiches. instant pot hard boiled eggs. Perfect for salads, lunch, a quick breakfast or snacks. Boiling Eggs in the instant pot is SO easy and they peel like a dream. Adjust the time and pressure for softer or harder yolks. 1 any size raw egg, up to the amount of eggs that will fit in your instant pot. About a dozen max. pour the water in your instant pot. Set the trivet inside and carefully set your eggs on the trivet (or whatever container you are using. Lock the lid and press the manual button. Set the time to 3 minutes on high pressure for a hard yolk. Once the pot dings let it natural release for 15 minutes. Remove the eggs from your instant pot and peel under cold running water when cool enough to handle. Store in your fridge until you need them. You can control how hard the yolks get by how long you cook the eggs and by using either low or high pressure and adjusting the natural release time. Experiment and see what works best for your desired results. For a softer yolk-cook the eggs under LOW pressure and quick release.